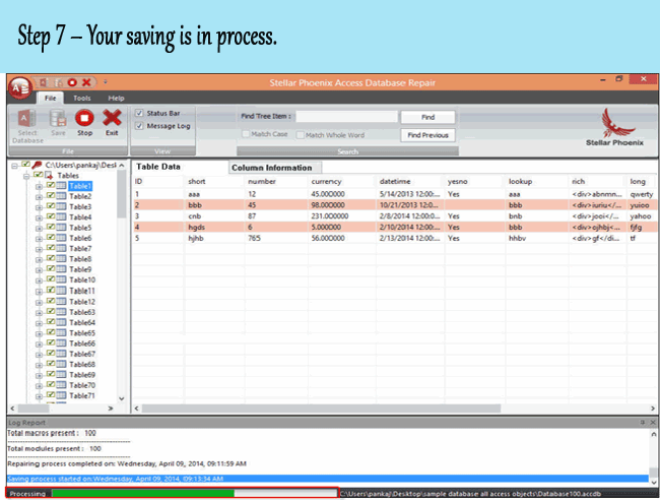 Is your Access Database file suddenly gets disappeared? Well it can be the issue of Access Database Corruption. As there are several things that impart Access database corruption or damage like issues. 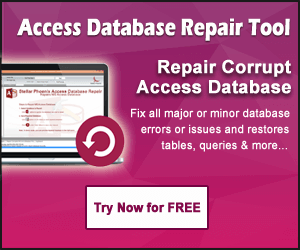 The symptoms of such corrupt Access database can easily identified, like sudden lost/deleted certain records, being unable to open of the objects in database or unable to Access particular database file etc. My Access MDB file has “disappeared” from his documents folder. I haven’t deleted it, I have checked recycle bin, and system restored, searched and so on. No luck! Any suggestions on what else I could do to recover the file? 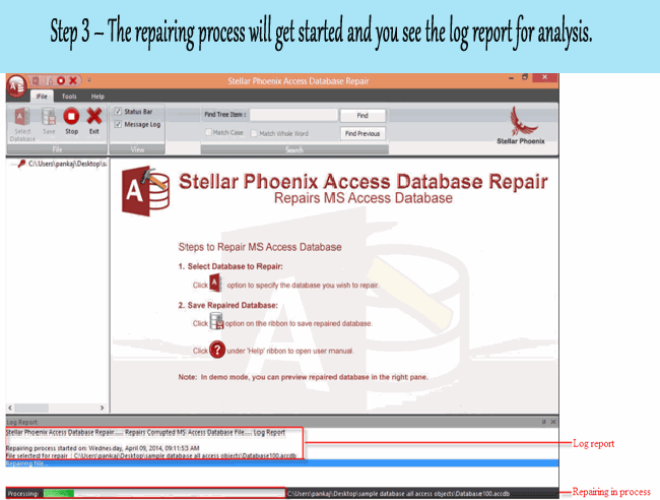 Well if you too rendering the same issue with your Access Database file then, this tutorial will show the easiest way to recover your MS Access Data. 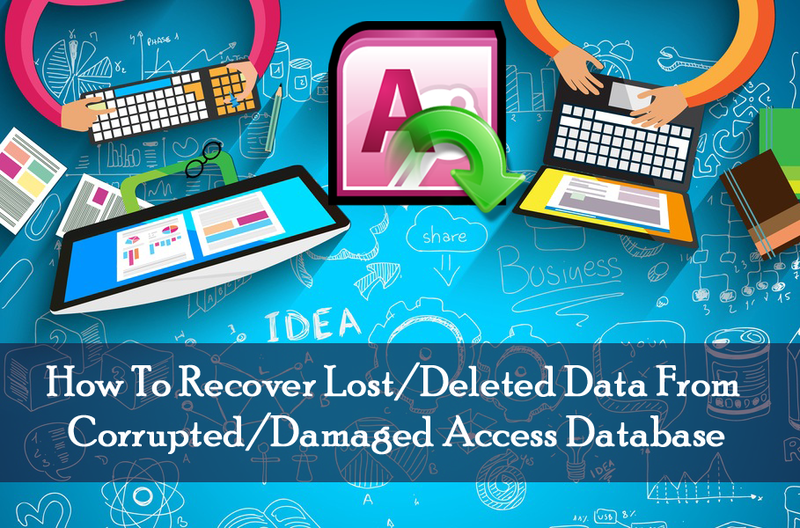 As, this post covers all the possible solution for Access database data recovery including the Access Inbuilt Utility Tool and other alternative solutions for repairing damaged Access Database. If you are using the Access 2003/2007/2010/2013/2016 database , you know that it is Microsoft’s proprietary Database Management System or DBMS. Just like the others application of Microsoft’s, it is also very user friendly and efficient. MS Access has rational MS Jet Database Engine comes with a development tools that are easy to grasp user interface at the front and are running at the back. They are very easy to use and also one of the ideal choice for most of the corporate. Sometimes database files are inundated by corruption that poses hazard to the enormously critical data currently present. MS Access is no exception as they also face corruption. What Are The Reasons For Corruption Of Access Database? Access Database corruption usually arises when the binary file format of a database encounter an error. Users normally face difficulty and random errors in such cases while using the database. The Jet Database Engine of Access is able to fix small problem that are gather in the database while writing and reading data time to time and because of this you may not able to find out something went wrong. 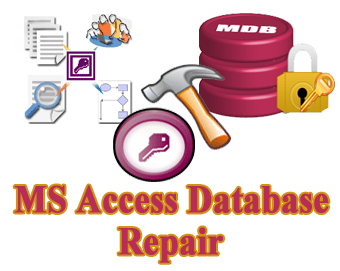 Therefore, it is necessary for you to know each and every aspect of corruption of MS Access Database. Here are some of the reasons behind the corruption of Access Database. Sometimes you may face corruption because of hardware failures such as bad sectors on hard drive and lost packets on network cards. Improperly installed or designed third party plug-ins for Access may corrupt the database. Regular edits to the data in Memo fields also increases the chances of corruption in Access Database. It normally results from a problem with a VBA module and does not create any risk to data loss. When the virus infects a file required by the Access database, as soon as file is used when the database is opened, the infection will extent to the database and may corrupt it. A small number of bugs in Jet software and Access also responsible for corruption in database. Sometimes multiple users’ uses same database having different Jet services packs and updates installed, slight difference in file locking mechanism and mdb file format causes database corruption. Improper shutdown of the system while some activity is being performed also resultant in corruption. 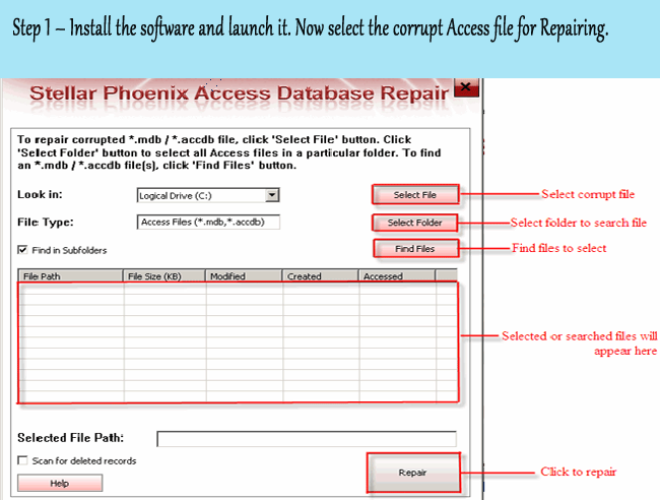 How To Repair Corrupt Access Database And Recover Lost Data? 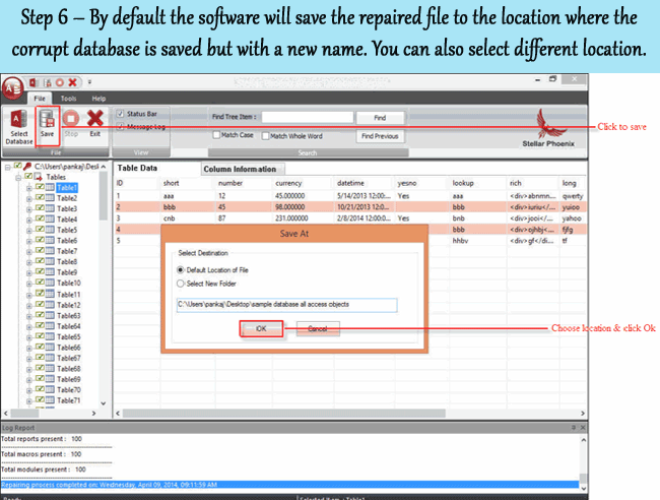 Manual solution mentioned in this post is usually successful to recover damaged mdb/accdb database files, but still it is recommended to create a backup of your database file as often as you can. 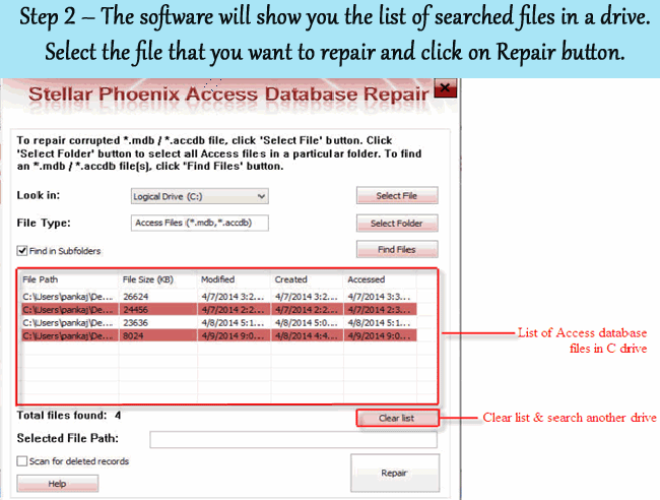 To fix Microsoft Access database and recovering data, you can follow the below mentioned methods. 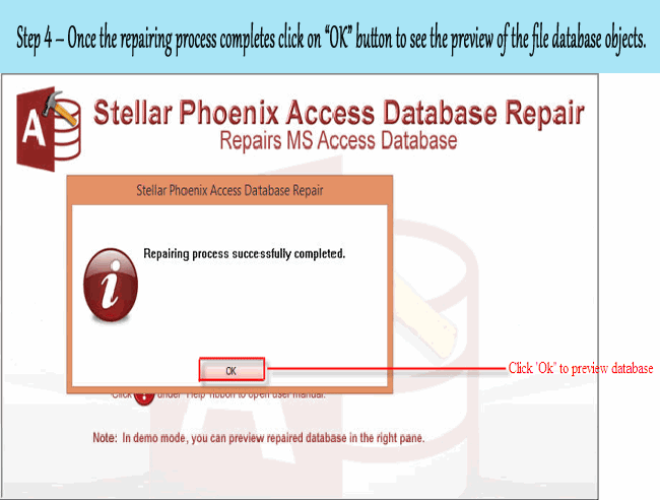 Open the MS Access and go to Database Tool -> Compact & Repair Database. After then find the corrupted database file and click on OK.
Once the process is complete, the selected database file will be rectified. Open MS Access and create a new database. In the External Data tab, click on Access to import Access database. Click on Browse and locate the database files in the nest windows. Identify the space to store data in the new database and click on OK. Select the all database objects that you want to import from the next Windows and click on OK. When VBA modules get complied in Access, the complied code is very much dependent on the VBA p-code parser library. There are few types of this library which can lead to corruption if the compiled code is run on various machines with different versions of this library installed. Microsoft added a command line witch to access that allows removing all complied VBA codes from an Access database, leaving only the non-complied source code in place. You can try the command line switch if you can gain access into your database but strange error messages will appear during this execution of VBA module/class code. You need to change the path shown above for MsAccess.exe if you installed it to different location. After the completion of the decompile procedure, you should close access and then re-open it compile all modules again. 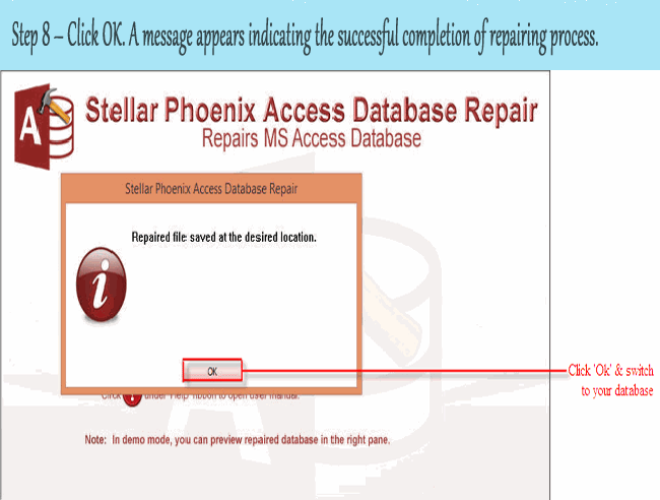 If the database corruptions still persist even after trying the above techniques, then the recommended solution is to use MS Access Repair and Recovery tool. 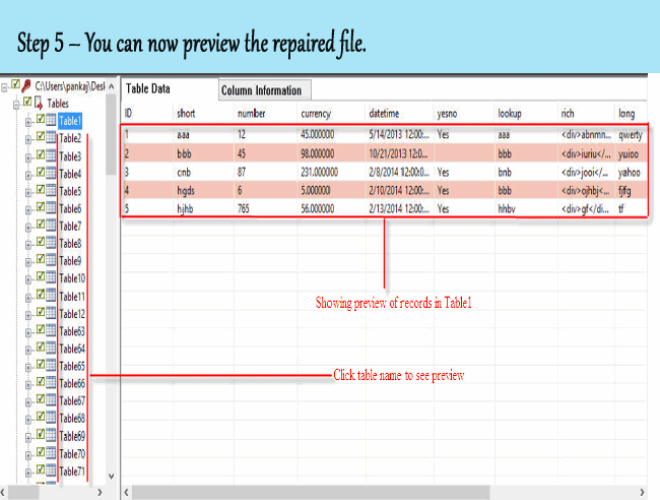 Using this tool you can easily repair database file and also able to recover data. 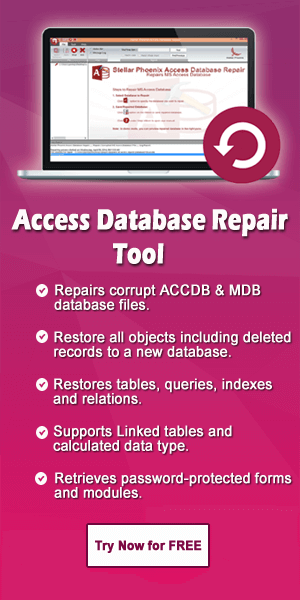 This tool is able to resolve any sort of database corruption and it helps you to repair and recover the corrupt , damaged or inaccessible database (mdb and accdb) file. It can easily recover the corrupt indexes, tables, relations and queries. Password protected forms or modules also retrieve with the help of this tool. So, it means you can unlock the password locked access file with this software. This software will work on all version of Windows operating system like Windows 95/98/ME/NT/2000/2003/Vista/7/8/8.1/ windows 10. For the right retrieval of your complete Access Database data, our recommendation is to go with the software solution. 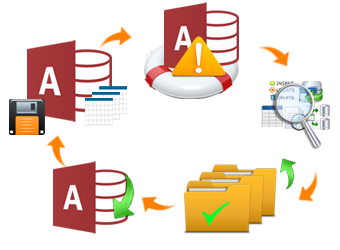 But if you are so sure to apply the manual solution perfectly then you can go with the manual steps to recover access database.